January 6th is Epiphany Day in France and the tradition is to make a Galette des Rois (French King Cake) and share it with family or friends. 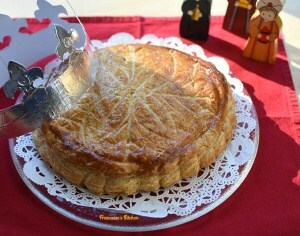 Bakeries, pastry shops, and greedy people extend this day-long tradition to make more Galette des Rois during January. 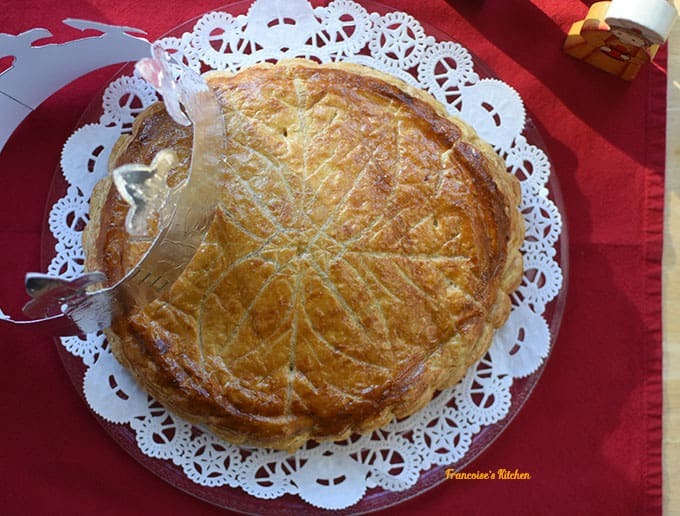 As a recipe, I usually make this Galette des Rois with the almond cream. But for change, I made a popular filling called frangipane. A frangipane is a mix of almond cream to which you add pastry cream. People are divided between almond cream and frangipane version. Some prefer one filling to the other depending on your taste. I like both filling but to be honest with you I have a little preference for the almond cream version. January 6th is Epiphany Day in France and the tradition is to make a Galette des Rois (French King Cake) and share it with family or friends. 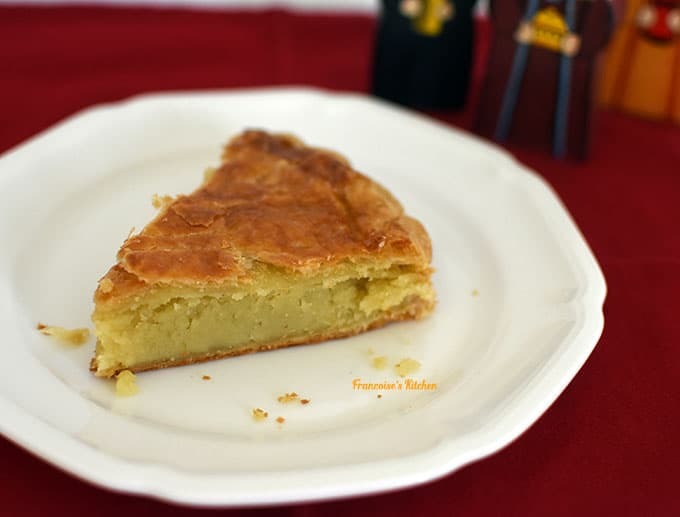 Greedy people extend this day-long tradition to make more Galette des Rois during January. Yum! Yum! 1 small charm (called "fêve"). If you do not have it place a whole almond (skin on) or a pecan half. Add the cornstarch to the cold milk and mix. In a small bowl, mix the 2 eggs and sugar. Then add the cornstarch mixture and stir. 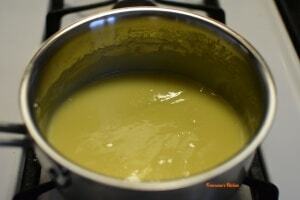 Put this in a small saucepan, cook on a low heat, and whisk continuously until it boils. 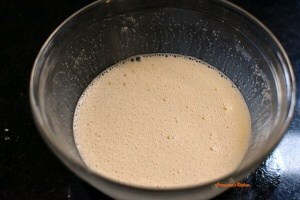 Let the cream thicken for few seconds, then remove from the stove. 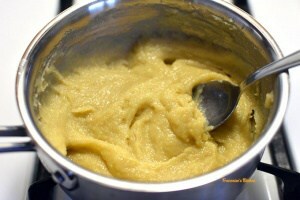 Add almond powder, vanilla bean seeds or vanilla extract, the butter, Rum or Amaretto or Marsala or almond extract. Set aside in the fridge. 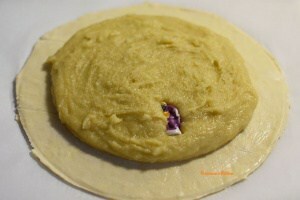 On a parchment paper, place the smaller circle of dough (24cm). Brush 1 inch of the edge of the pastry dough with water or an egg yolk mixed with a little of water. Spread the frangipane cream filling over the center or use a pastry bag and start to pipe in a spiral in the center until you are close to the inch that you just brushed with water or egg wash. Put the "fêve" in the frangipane cream filling in a vertical position close to the edge and not in the middle or the galette. Put the second bigger circle of puff pastry (27 cm) on the top of frangipane cream and gently try to remove all the air between the filling and the dough with your hand. Then press well with your fingers all around the circle to be sure that the edge is well sealed. 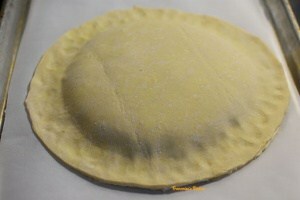 Carefully return the galette and put it on a baking sheet with parchment paper or silicone baking mat. If you did not use an egg to seal the dough, prepare the egg wash by mixing a yolk with a little water and evenly brush the entire galette with a cooking brush. Be careful to not put egg on the outer edge of your galette otherwise your puff pastry will not rise correctly! 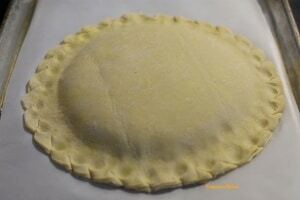 Take your galette from the fridge and again put egg wash so the galette will be bright when cooked. 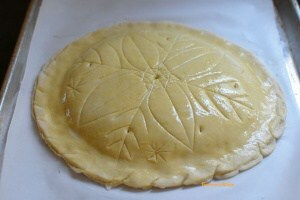 In the same way, you use the knife to score it, draw without pressing too hard a decorative design (crossed lines, curves lines, leaves, flowers...) on the top of your galette. To allow the steam to escape, give few pokes with your knife in the top of your galette to avoid the cream filling to escape. Put the galette in the oven for 30 to 35 min until golden. Take out the galette from the oven and wash the surface with a syrup made and return for 3-5 minutes the galette in the oven so the galette will have a shiny finished. Let it cool down for a few minutes to enjoy a part of Galette des Rois and maybe to be the king (or queen) of the day if you got the "fêve". Merci Christine ! Avec une pate feuilletee maison elle serait encore plus jolie il faut que je me lance… Au passage Bonne et Heureuse Annee et bonne galette !